I recently taught a two day workshop in processing archival AV collections. The main objective of this workshop was to teach a handful of professionals how to identify key information from a collection full of audiovisual materials: information that can help them to understand what their organizations need to do to preserve these items. The first day of the workshop involved my lecturing and showing pictures of format examples that we would more than likely run into at a university archive. I was teaching up a storm how to ID the most basic of AV formats: and this is no easy feat as there are a ton of them! By the end of the first day I was feeling very confident indeed. Two things stood out to me about this format: 1.) 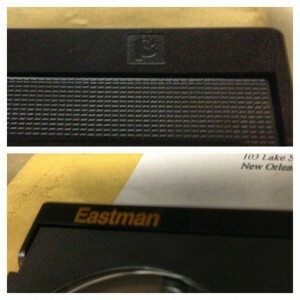 I had no idea Eastman Kodak got into the video cassette business, and 2.) despite this having the Betamax logo on it (the Greek symbol for “beta”) nowhere did it say "Betamax" or "Betacam". Considering these tapes were recorded by the Athletics Department of a university, and it was stored with a bunch of other Betacams (and Betacam SPs), then this is probably a Betacam. I don’t think they would’ve switched recording technology, especially since Betacam SP is so much higher in quality (and therefore expense) than Betamax. But I wanted to supply some sort of definitive answer for the workshop attendees, not just a day full of maybe's and probably's. Turns out that Betacam and Betamax are mostly interchangeable, so the only way to tell the difference is by popping these questionable tapes into a machine—which we didn’t have on hand and I wouldn’t necessarily recommend doing if it was a very unique recording (which it did seem to be). Oh, and just to trip you up a little bit more, it could also just be audio, because you can record audio-only on Betamax tapes which people occasionally did (probably more often than I would like to think). I would make an assumption that since this was once again recorded by the Athletics Department, they wanted visuals and not just audio, as the visuals are the most important aspect in studying game film (my Dad was a football coach). The solution turned out to be that there is no solution! What is the exact different between Betamax and Betacam? Oh, and then what about Betacam SP, SX or Digital Betacam? Tune in to the next UCLA Library Preservation Unit blog to find out, as well as more about another tricky AV format you might have hiding in your attic or your archive: Fischer-Price’s PixelVision!